NE 8th Ave and Hallandale Beach Blvd | Car Accidents in Hallandale | Sackrin and Tolchinsky, P.A. Home – Hallandale Injury Articles – NE 8th Ave. and Hallandale Beach Blvd. It’s no surprise when someone tells you about a major road having a large number of car accidents. Car accidents on Hallandale Beach Boulevard are a major cause of property damage and injury each year in Hallandale, Florida. So much so, that we have spent several months analyzing crash data provided by the Department of Transportation regarding the areas in Hallandale Beach where the most car accidents occur. We have discovered that the intersection of NE 8th Avenue and Hallandale Beach Blvd. has a surprising amount of accidents for an inside street. Why is that? We wondered the same thing. View of NE 8th Ave and Hallandale Beach Blvd. heading west on Hallandale Beach Blvd. NE 8th Avenue is a small, partially residential street that runs from Moffett St (East of Pembroke Road) all the way down to just slightly south of and running perpendicular to Hallandale Beach Blvd. According to our observations, people have been using NE 8th Avenue heading south towards Hallandale Beach Blvd. as a straight away in an attempt to cut through from other streets. Those people speed up to try to make it through the intersection before the light turns red, since the light takes a long time to change. Also, the entrance to the Sage plaza has a dip in the road so the driver will be forced to suddenly hit their breaks, which is very dangerous. The driver behind him, also speeding to make the light, is not prepared for the front driver to slam on his brakes nor does he have enough distance to come to a safe stop. This can then lead to a rear-end collision. 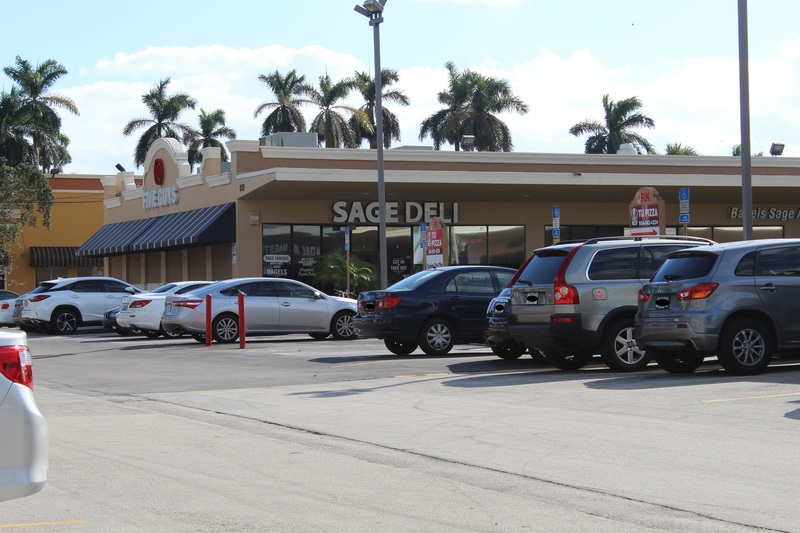 View of Sage plaza heading East on Hallandale Beach Blvd. past NE 8th Ave.
Another possible cause of accidents at the NE 8th Avenue and Hallandale Beach Blvd. intersection is a driver trying to make the left turn from Hallandale Beach Boulevard heading west to turn into the Sage plaza. When their left arrow light turns green, someone may be speeding from NE 8th Ave trying to make their light before it turns red. The driver with the right-of-way may begin driving forward, thus colliding with the speeding driver. Another leading cause of car accidents is failing to yield to the right of way. 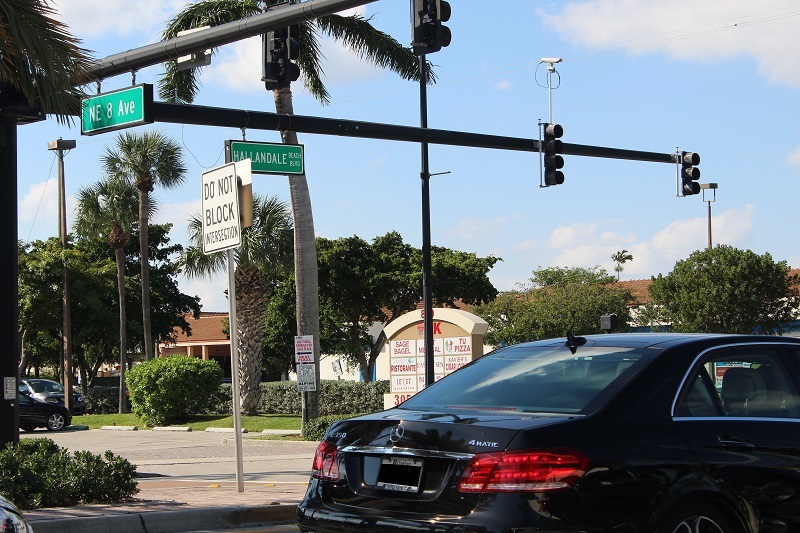 In an attempt to make a right turn going west onto Hallandale Beach Boulevard, a driver may cut a driver off who had the right of way, not giving him or her a chance to slow down and thus rear ending them or can even result in a T-bone collision. We are not traffic reconstruction experts but being in the community and having driven these roadways and eaten lots of bagels from Sage, this is our educated guess as to why these accidents are occurring. Fill out the “Talk With An Attorney” form above to ask a question or call us at 954-458-8655. We promise to get back to you promptly. Ask now.